AngloGold Ashanti has signed the regulatory and fiscal agreements with the Government of Ghana that will provide the framework for the redevelopment of the Obuasi gold mine into a modern, productive mining operation. The Government of Ghana and AngloGold Ashanti have put in place several agreements including a Development Agreement, Tax Concession Agreement, Security Agreement and a Reclamation Security Agreement. The Environment Impact Assessment process has been completed and the permits are expected shortly. Two documents – the Tax Concession Agreement (TCA) and the Development Agreement (DA) – must now both be ratified by Ghana’s Parliament to be made effective. Obuasi gold mine has been in limited operating phase since 2014, and the Government’s support will go a long way to enabling it to restart as a modern, productive, long-life high margin operation. This will benefit the local, regional and national economies of Ghana through taxes, job creation, communal development expenditure and local procurement opportunities. AngloGold Ashanti has conducted a feasibility study into the redevelopment of the mine. The study tested the viability of redeveloping the high-grade Obuasi orebody, which has 5.8 Moz of Ore Reserves and 34 Moz in Mineral Resource, to create a safe, long-life mining operation that is productive and profitable. The outcomes of the TCA and DA have been applied to the feasibility study. The project implementation will be undertaken in two distinct phases, with stage one comprising project establishment, mine rehabilitation and development, plant and infrastructure refurbishment to enable production at a rate of 2,000 t/d for the first operating year. This is expected to take roughly 18 months, with the first gold pour expected in the third quarter of 2019. The second phase includes refurbishment of the underground materials handling system, shafts and ventilation; and construction of the primary crusher, the SAG/Ball circuit, carbon regeneration, a new gold room and tailings storage facility. This expected to take a further 12 months and enable the operation to climb to 4,000 t/d. The operation is then expected to ramp up to 5,000 t/d, over the following three years. Mine production for the first 10 years will be focussed on the upper orebodies and is expected to average 350,000 to 450,000 oz at an average head grade of 8.1g/t. In the second 10 years, production averages 400,000 to 450,000 oz. Total cash costs are expected to average between $590 to $680/oz, while All-in Sustaining Costs are expected to be between $750 to $850/oz. The project delivers IRRs of between 16% and 23% at real gold prices of between $1,100/oz and $1,240/oz, and is highly leveraged to the gold price. Initial project capital expenditure anticipated over the first two and half years is expected to be between $450 to $500 million, excluding pre-production capital of $64 million. 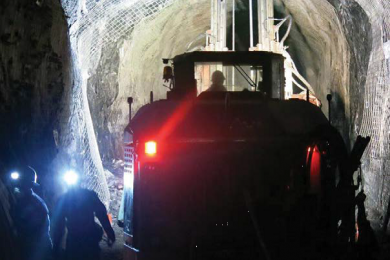 After the completion of phase two, extended project capital expenditure of $94 million is expected to continue through to year six, covering the development of the Obuasi Deeps Decline to the lower level of the mine, refurbishment of the KMS shaft, installation of new underground pump stations and construction of the flotation tailings storage facility. It envisages a smaller but skilled workforce that can operate in a mechanised/automated operation with a strong sense of accountability. The operation is expected to create between 2,000 and 2,500 jobs. Additional roles will be required during the construction phase of the project. The footprint of the mine has been significantly simplified. The lease area has been reduced from 475 to 201 km2. The operational footprint has been simplified and is concentrated in a fenced location in the south, allowing for tighter security, access control and the demarcation of the mine from the neighbouring community. AngloGold Ashanti has a 100% interest in Obuasi, which is located in the Ashanti region of Ghana, 200 km northwest of Accra. The mine was acquired by AngloGold in the merger with Ashanti Goldfields in 2004. The falling gold price in 2013 overtook restructuring efforts to improve the profitability of the operation. The Obuasi mine has embarked on a fundamental restructuring programme since 2014. This became necessary because the mine had been operating at significant losses for a prolonged period. Underground production was suspended at the end of 2014, and the entire workforce was retrenched. The mine entered a Limited Operating Phase (LOP), through an Amendment of Program of Mining Operations (APMO) which was approved by the Government of Ghana. The focus during the LOP was the clean-up and processing of tailings at Diewuoso, continued construction of the Obuasi Deeps Decline, the maintenance of surface and underground infrastructure, water treatment and meeting environmental obligations and social commitments. In parallel, a feasibility study for the redevelopment of the Obuasi mine was conducted. The feasibility study underwent several iterations and optimisation to define the best configuration of project design, capital and operating cost and cashflow for the redevelopment.